A review of the current Montgomery County market statistics confirms what most people already know: it’s still a buyer’s market. Inventory is up almost 15%, and median price is down to $410,000, about 8.5% from May 2007. Number of sales is down 33% from 2007, and days on market is up 24% from a year ago. Does this mean buyers should wait? Maybe. As always, it depends on your personal circumstances. However, with the passage of time comes the uncertainty in the lending market. Just in the past year, we’ve seen the elimination of 100%, 95%, and even 90% financing in many cases, meaning much larger down payments for buyers. We’ve seen higher interest rates, stricter credit requirements, and fewer loan options. Though FHA has become a viable option thanks to higher limits in our area, the loan limit of $729K remains temporary through the end of 2008. Further, market statistics may be lulling buyers into a false sense of security that time is on their side. 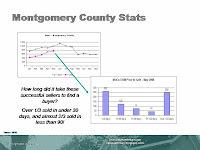 Similar to Arlington (see my 2007 Post: Some Sellers Do Get It, and Get It in 30 Days) the average days on market in Montgomery County of 103 is very misleading, and buyers may be fooled into thinking they have plenty of time to think about whether or not to make an offer on that house that they love. A review of the successful sales in May reveals that over 1/3 of the homes that sold were on the market less than 30 days, and almost 2/3 were on the market less than 90! Then, as with every market in our area, there are the homes with sellers that drop and drop and drop the price to what is eventually the ‘correct’ price, and they sell sometime in or after the 4th month. As I’ve mentioned before, once a buyer sees 10-12 homes in a given neighborhood, it becomes pretty easy for one to identify the ‘value priced’ homes, that is, that 1 in 3 that will sell quickly. The issue for buyers is that all the other circling buyers out there recognize it too, and at least some of them will jump on the opportunity when they see it. Montgomery County is a big place, and it’s unfair to paint the entire area with one brush. Contact me to discuss the neighborhood you have your eye on, and to see whether it’s one that is following the trend, or whether waiting may not bring as much benefit as you hope. After all, an average is made up of points higher and points lower–see where your dream neighborhood falls in the range. Interested in learning more? I will be teaching a free, one-house first time home buyer class at Montgomery County Library on July 31st at 7:30. We will be covering a general market overview in addition to the mechanics of the home buying process, including tips and tricks. There is no cost to attend, but registration is required. Contact me to sign up. This entry was posted in first time homebuyer. Bookmark the permalink.